This article appeared in the Kingston Guardian on the 2nd of April. 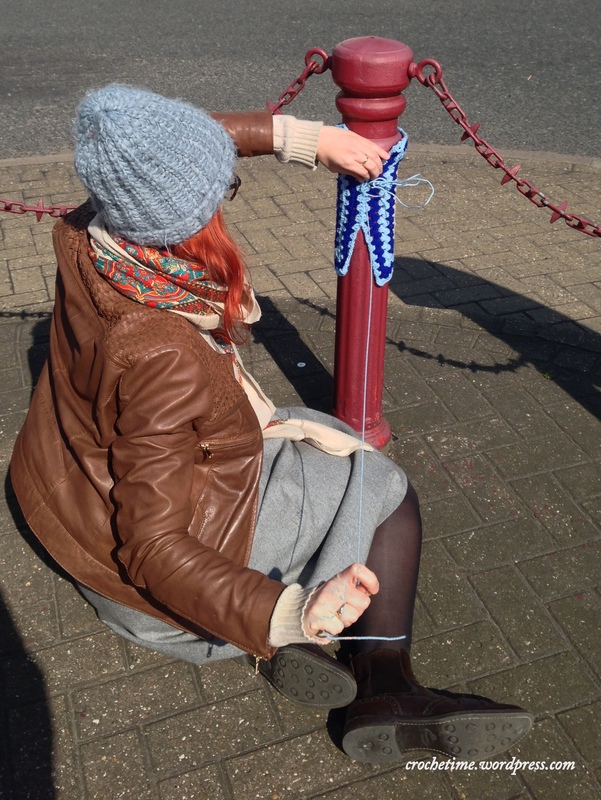 Although the title refers to it as knitting, the reporter does say that the yarnbomb is crocheted. Phew! She also calls us “yarn bombardiers” and “craft connoisseurs”. Love that!! No introduction needed for this photo, hey? 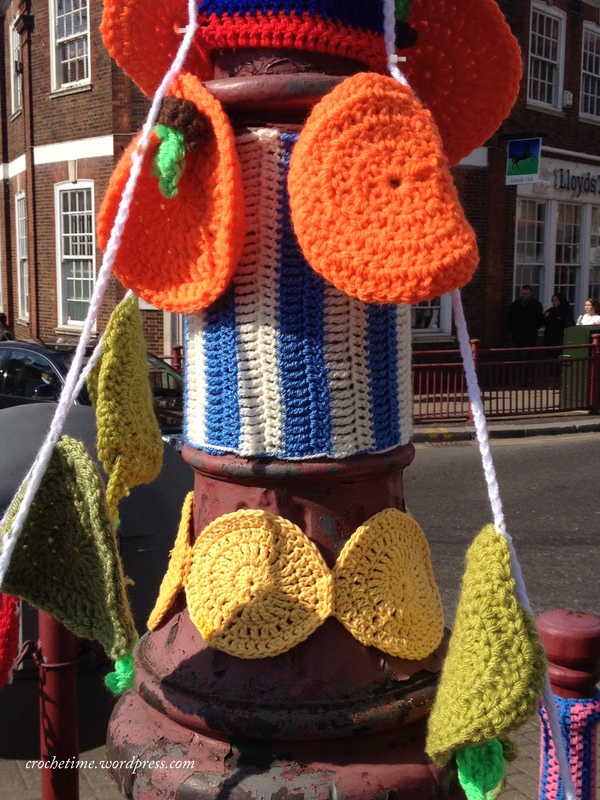 As you can see we yarnbombed the lamp post and five bollards on the traffic island in front of Surbiton station. In the space of one hour, the roundabout went from drab and dreary to striped and adorned with fruity bunting – the way all roundabouts should be I think. It was soooooo much fun and I’m still on a yarn high! Bobi Robson, from The Craft Inn came along to give John and I a hand. Her help was much appreciated, and it ended up being a brilliant team effort. John had the great idea to bring along packaging tape just in case we needed it to keep the stripes up on the lamp post (and we did! 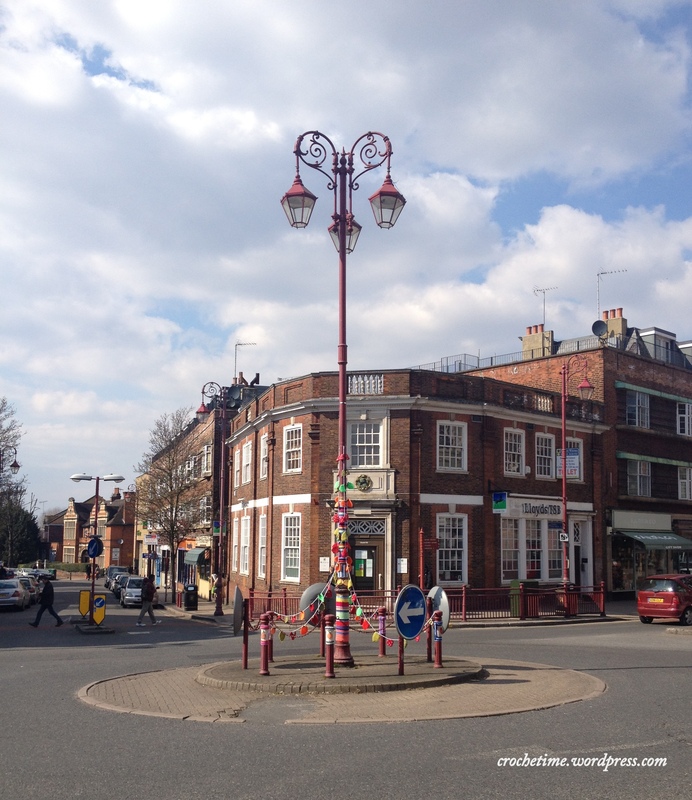 ), Bobi suggested we attach the bunting lower down on the lamp post to prevent the wind from blowing the bunting into cyclist or cars, and when we realised our cable ties were too short to go around the bollards, I suggested we tie the bunting to the cable between the bollards. Three problems – three genius minds at work. I think John was amazing. 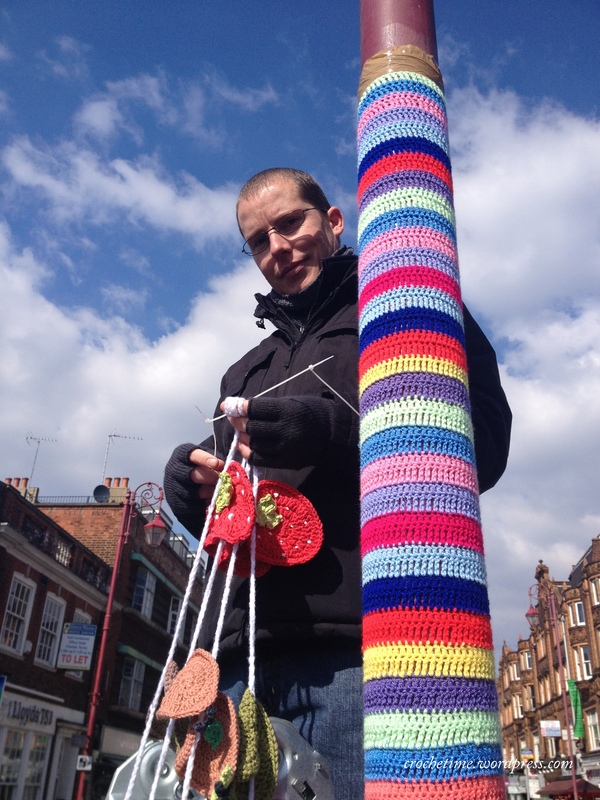 He sewed two of the granny squares onto the bollards (a very unmanly thing to do for, what felt like, the whole of Surbiton to see) and then took on the task of getting really, really high on the ladder to put up the bunting (thereby redeeming his manliness). The end result of our hour on the traffic island, and my four weeks of crochet, is a brilliantly colourful work of yarn graffiti. 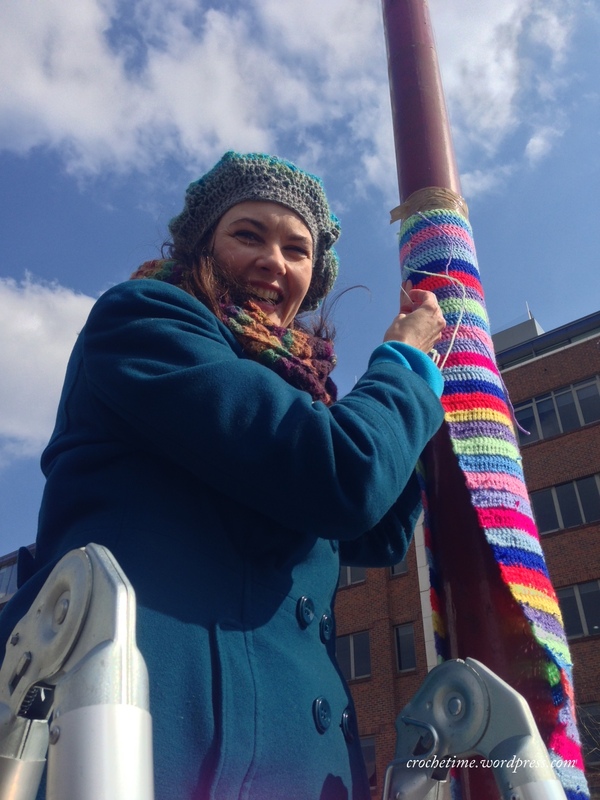 Bobi and I at the Surbiton roundabout yarnbomb. 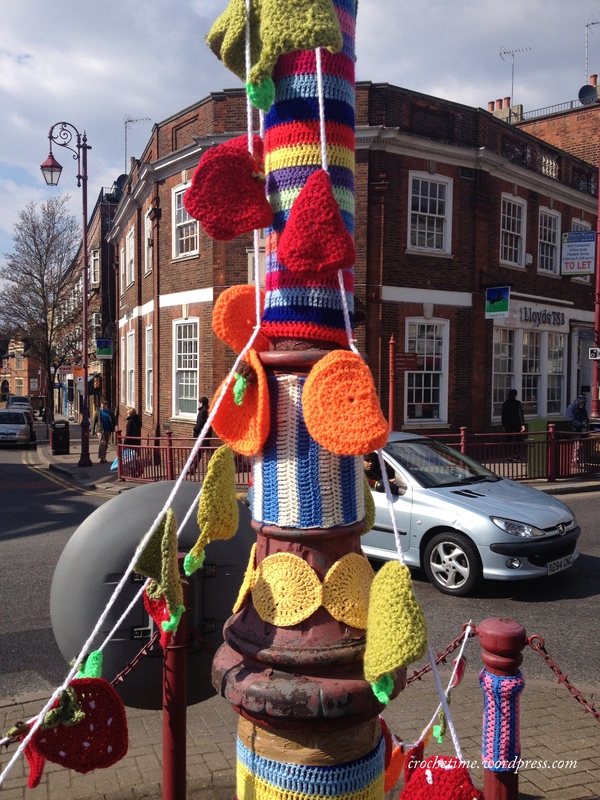 I hope the yarnbomb will raise awareness for the upcoming Surbiton Food Festival. 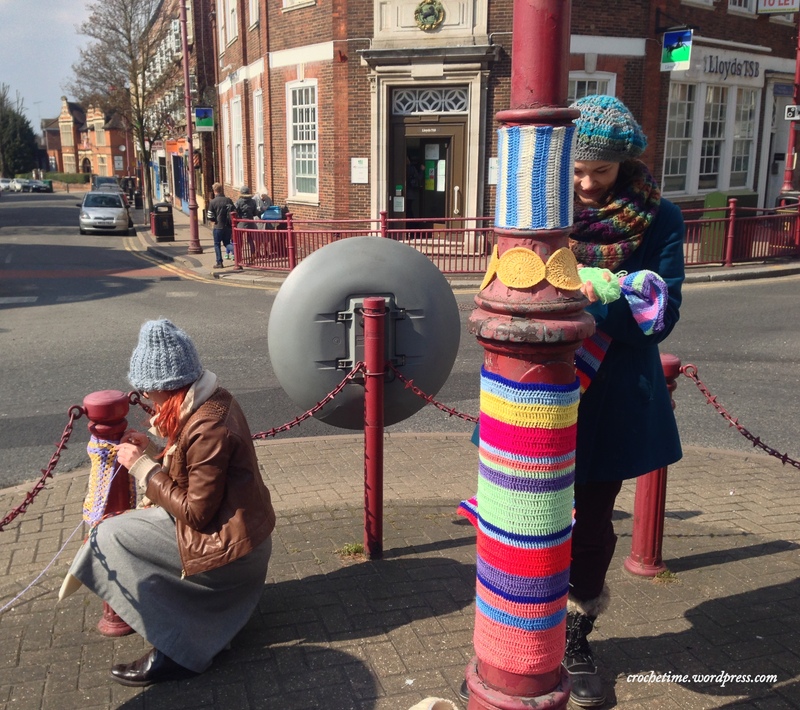 If you found this blogpost because you Googled “weird woolen stripes on Surbiton roundabout” please also visit the Surbiton Food Festival website here, and of course come to the festival in May, otherwise my hours of crochet would have been in vain. Well, probably not totally in vain because even if people don’t realise a food festival is coming, at least they can appreciate a bit of stripey colour in the middle of Surbiton. And as you can gather, I thoroughly enjoyed myself and I’m kinda proud of myself. This is my biggest, most prominent yarnbomb yet. The other three (warm-up yarnbomb dare I say?) are here here and here. I hope you enjoy the new and improved traffic island. 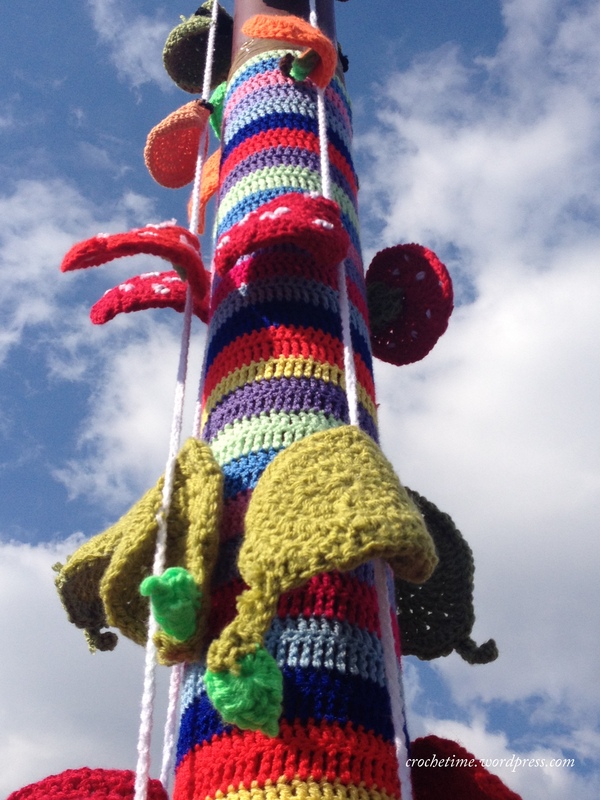 As far as I know the yarnbomb is staying up until the end of the Food Festival (19th of May) so you will have a lot of time to appreciate it in all it’s fruity glory. Here’s a video giving you a 360 degree view of the yarnbomb. 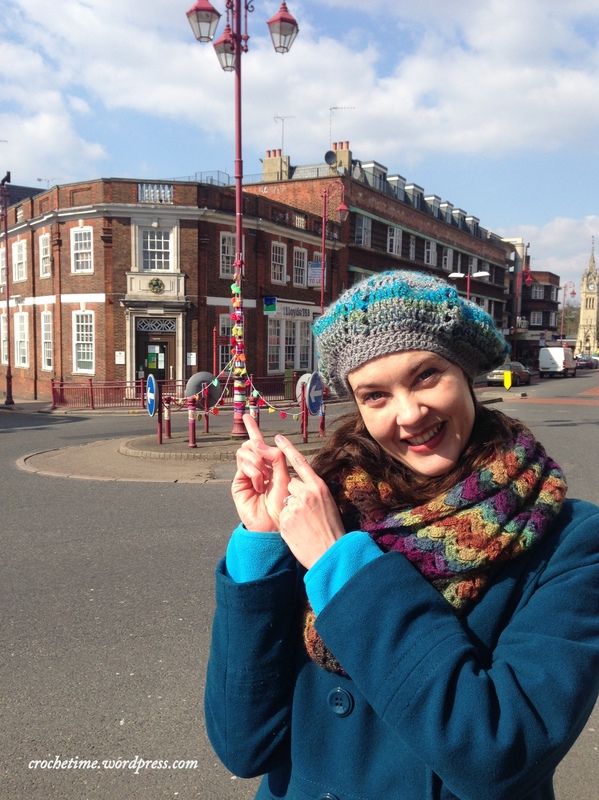 Keep your eyes peeled around Surbiton, as Bobi and her Craft Inn pals will be adding more granny squares to the railings around the roundabout, and other crafty items will pop up around St. Andrews Square. You have been warned. The craft bombers are coming! P.S. If you ever get the urge to crochet apples, pears, oranges or strawberries like I did for this yarnbomb, there is a link to the pdf pattern in this blogpost. The fruit were originally designed by Louise Howe. They make excellent coasters. Which is what she designed them to be…. until this yarnbomber got her hook into them.